Over the past few years, I’ve been looking at how we operate as a family. What we eat, what we buy, what we throw out. And while we’re not 100% clean eaters, and don’t make all our own clothes, or use only public transportation, we do try to be mindful and go green where we can. And since all these areas overlap, we get extra benefits, too. Being picky about what we buy also saves money…eating clean is good for us and also good for the planet…that sort of thing. 1.) Use cloth napkins instead of paper. We pick ours up at thrift stores, or if we’re feeling creative, make our own. I can’t even tell you how many paper towels our family of six rather messy people used to go through in a month. Switching to cloth saved us money…and time, too, because I no longer have to remember to buy them at the store. 2.) Grow a garden. Good for the bugs and the air. 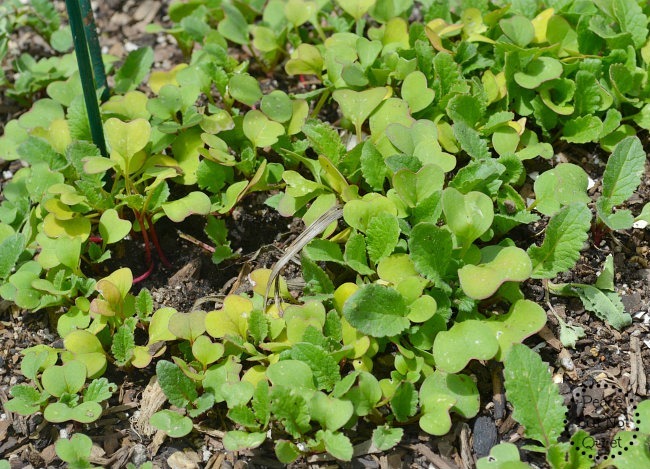 Good for the kids, to help them learn about the science of growing things and get them to eat their veggies. Good for us because we don’t have to buy produce later this summer, and we often have enough to freeze or dry (or can, one of these days if I ever learn to can stuff). 3.) Make our own bread. And granola. And cookies. Sometimes chicken nuggets. Homemade goodies are better for you, and use less packaging than storebought stuff. And I know you can’t do everything. I don’t. But when you can make your own food, it tastes better and uses less packaging and is a good green option. 4.) Use washable containers. Like the paper towels, we go through a lot of sandwich baggies. When we replaced them with plastic containers, we saved a lot of money and a lot of garbage. And in the summer we take our lunches on the road a lot — to go hiking, to pools, to museums or parks. Added bonus: the plastic containers hold up a lot better so our packed sandwiches don’t get all squished and mushy like they do in plastic bags. 5.) Compost. This is new for us this year. 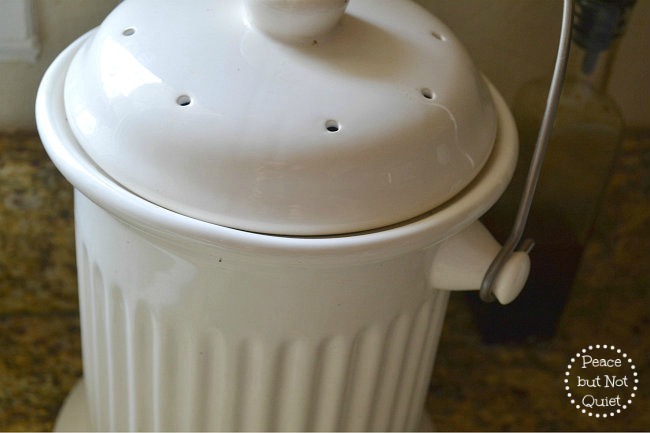 We have a cute little kitchen compost can, and we add all our food scraps to it. At the end of the day, I dump it all in a big plastic bin out back, toss it around with some water, and let it do its thing. I add the compost to our garden with some pretty great results so far. I know there are a gazillion ways to make your life a little more eco-friendly — these are just five of the easy ones we’re trying this summer. How about you? 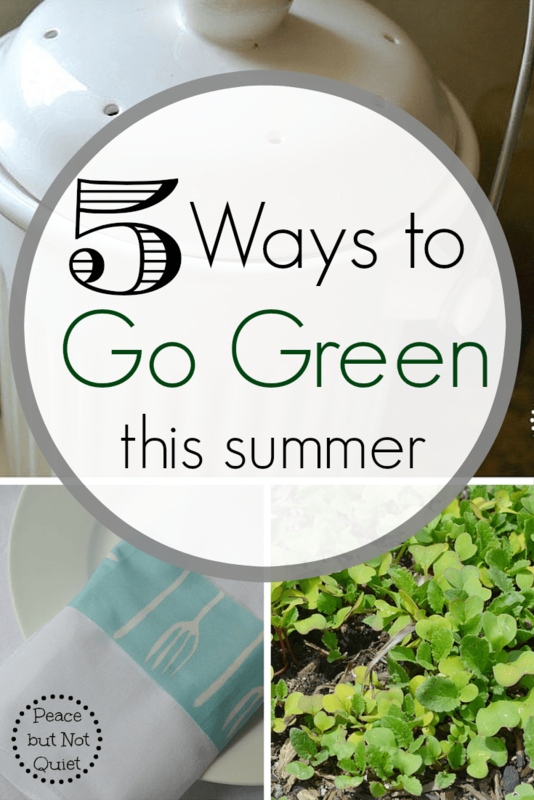 Do you have any simple tips to go green?